Like everyone else, I had been hearing about this book for a while, but it didn’t seem like I would like it enough to buy it. So when I saw it, along with the second book, Girl of Nightmares, at the library, I picked them up. And im glad I did. I don’t normally like scary things. I get nightmares super easily. So I was a little weary of this book, at first anyway. Once I started reading it, I knew it wouldn’t be too bad. The story is about Cas, a teenage boy, who is a ghost killer. His father was killed 3 years ago ghost hunting, and so now Cas has made it his lifes mission to be a good enough ghost killer that he can kill the thing that took his father from him. This leads him to Anna. 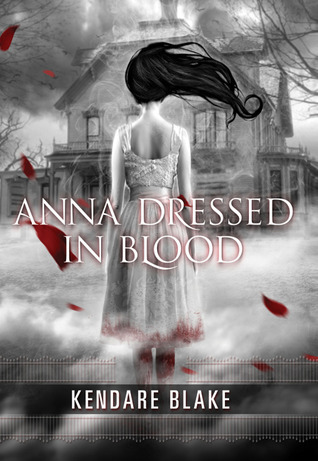 Anna is a ghost in Canada, that has been killing people for the last 50 years. Anyone who enters her house ends up in bloody piles of dismembered arms and legs. But she is different. She can’t control it, and she actually wants to be able to control it. She has a consciousness that no other ghosts do. And for some reason, she doesn’t have to kill Cas, like she feels she has to for everyone else. The history behind why Anna is the way she is…. Well its sad and crazy and so hard to explain without giving anything away. But even though it was sad, it made the story that much more real. We are taken on this journey with Cas, trying to figure out why Anna is so different and what his fathers murdering ghost has to do with any of it. It wasn’t nearly as scary as I was led to believe. The only part that actually scared me at all, was at the end… something happened that could have happened in real life,(spoiler: the ghost was up in the attic- and when they heard noise up there, right when they figured out he was there, he started coming down… and they knew they were trapped. They being Cas and his mother. And all I could think about was that something like that COULD happen-minus the ghost part. A bad guy could hide in your attic and totally trap inside your home.) and it totally gave me the willies. And really, I think the reason I love dthis book so much, is that it reminded me of my boys, Sam and Dean from Supernatural! The whole times, I kept reading Cas’s thoughts in Deans voice! I've been seeing this book everywhere but didn't know if it was worth it. Now I do! Thanks for the great review. Another one for the pile!